Micro-grippers may be able to navigate unstructured environments and could help reduce risk during surgeries, according to a study published December 13, 2017 in the open-access journal PLOS ONE by Federico Ongaro from the University of Twente, The Netherlands and colleagues. Microrobotic technologies such as micro-grippers could potentially help grasp and manipulate objects in unstructured microscopic environments. For example, wireless micro-grippers that are powered by the heat of their surroundings might navigate blood vessels more precisely than current medical devices, which must be tethered to a power source, and this could potentially reduce risk during some surgeries. The researchers created four different types of heat-powered micro-grippers, of differing shapes and sizes but all less than a millimeter long. They tested how each navigated a virtual PacMan-like environment filled with obstacles. Their model showed that the micro-grippers could navigate the virtual maze at up to 3.4 body-lengths per second and that the length, volume and shape of the gripper were important characteristics for navigating the maze successfully. Their analysis suggested that three of the designs might theoretically be capable of moving against the blood-flow in capillaries, which averages 0.3 mm/s. While these results are specific to the chosen designs, they provide quantitative data for future designers to construct micro-grippers to suit their needs. The researchers next hope to explore how their grippers navigate blood flow in a three-dimensional environment. 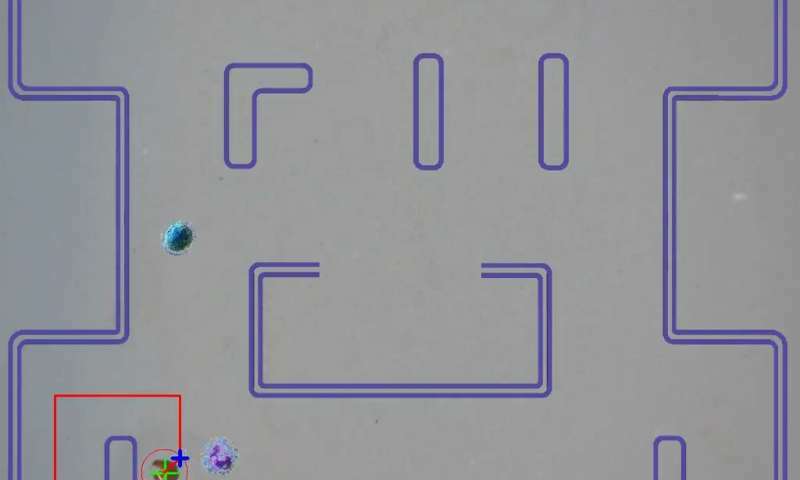 "This work demonstrates autonomous planning and control of magnetic micro-grippers in PacMan-like mazes," states Ongaro. "The applications for this work are in minimally invasive surgery and micro-manipulation."